Tired of typing UPPERCASE when accidentally press Caps Lock? 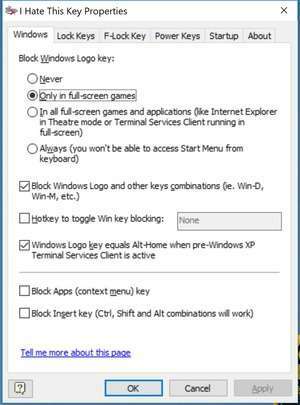 Hate Win Logo key when Start Menu opens while you're in hot battle in Quake or Counter-Strike, or working in full-screen Terminal Services session? Want to stop unwanted shutdowns and stand-bys after accidental Power or Sleep key pressings? this software download will help you to stop these inconveniences. I Hate This Key Deluxe Edition 5.0 is a shareware program and can be used as a demo to try the software until the free trial period has ended. A full version of the program is available after the trial period ends. For security reasons, you should also check out the I Hate This Key Deluxe Edition download at LO4D.com which includes virus and malware tests. Additional screenshots of this application download may be available, too.